Born in Somerset, Tim joined the staff of Cardiff University School of Music in 1978 having graduated at Cardiff University with first class honours before continuing postgraduate studies (M.Mus. and Ph.D.) in composition with Alun Hoddinott. As an instrumentalist he both played (violin) and sang at county level (even briefly playing clarinet in a local wind band); he also held the post of organist and choirmaster for a number of years. As a composer he has had works performed and broadcast around Britain and Europe as well as in America. He has worked in various genres including two piano sonatas which were premièred by Martin Jones. In 2000 he was commissioned to write music for a 'Son et Lumière' celebrating the millennium in Crewkerne, Somerset; most of the music was produced using the Music School's electro-acoustic studios which he directs. Tim has conducted the University Choir and Orchestra since 1987 since which time both the forces and repertoire have grown including established repertoire works (such as Orff's Carmina Burana, Verdi's Requiem and Elgar's Dream of Gerontius) as well as more ambitious works (such as Mahler's Eighth Symphony). 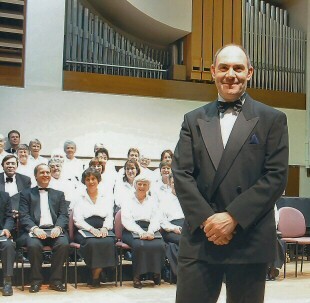 Tim was appointed conductor of the Cardiff Bach Choir in 2003 following the retirement of Cliff Bunford.